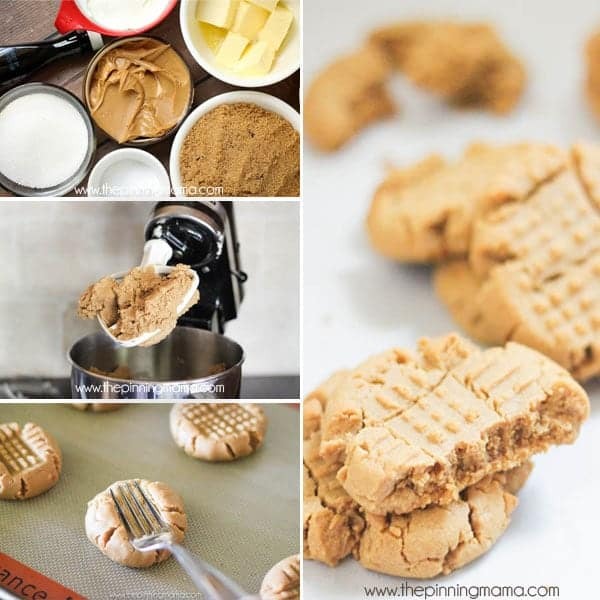 These are the ULTIMATE peanut butter cookie! 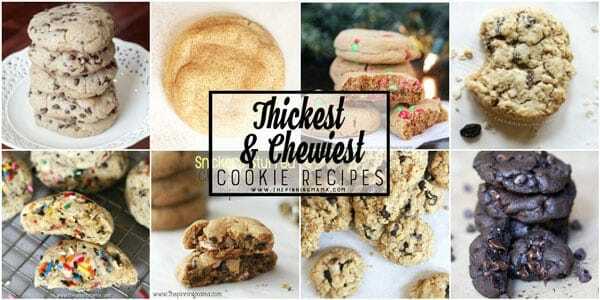 This recipe makes a soft, chewy and super thick cookie that will be one of the best you have ever had! Everytime I show up with these cookies, not only do they disappear, but I get endless requests for the recipe, so I am sharing it with you today! 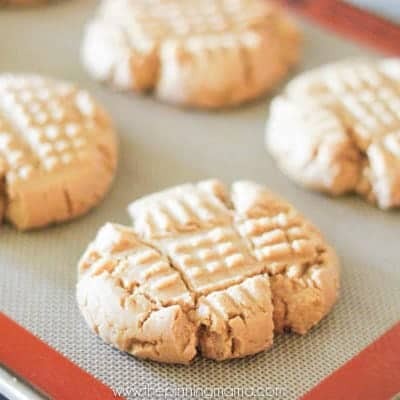 I experimented with making this recipe a few times and each time they were good, because you know it is a peanut butter cookie, and that makes it pretty hard to be bad, but each time I thought it was missing something, so I would try again. After what seems like 100 pounds of butter I made these peanut butter cookies and there was absolutely nothing I could do to improve them. In my mind they were a little piece of heaven! These cookies are soft. They are chewy. They are super thick and delectable. This for me is the epitome of what a cookie should be. If you feel the same then you really do need to try this recipe! It all started many years ago with my obsession search to create the perfect chocolate chip cookie. I absolutely hated it when I went to make a cookie and it would get thin and spread. So I decided if I couldn’t find the perfect recipe for me, I would just have to make it. So after lots of reseach into the science of baking and another 100 pounds of butter, I finally found a recipe that never failed me. Then I started making over all of my other cookie favorites. You can see all of my Thick & Chewy Cookies here. After all that talk, you may think that these are really complicated or special. The great news is that these are super simple to make and you can whip them up for friends, family, or even better… yourself, in no time! Then, start by combining your dry ingredients, the flour, salt, and baking soda, in a medium bowl and mix to combine. Next, combine the butter shortening and peanut butter in your mixer or a large mixing bowl. A couple of notes on this… First, I recommend Jif Peanut Butter for these. There is just something about that classic peanut butter that just gives these the richness that makes them over the top amazing. If you want to use a different brand then that can work as well, BUT you need to use regular peanut butter, not natural or other kinds. They have different rations of fat (oil,) solids, and sugars than “regular” peanut butter so the cookies just don’t work the same. With that said, you can use crunchy or creamy, whatever you prefer. In the cookies pictured about I used regular, creamy Jif peanut butter and boy were they good! Also, I frequently get asked about whether you have to use shortening in my cookie recipes. Shortening has a higher melting point than most fats so it helps the cookies to keep their shape as they bake and create that holy grail of thick, soft, chewy centers. 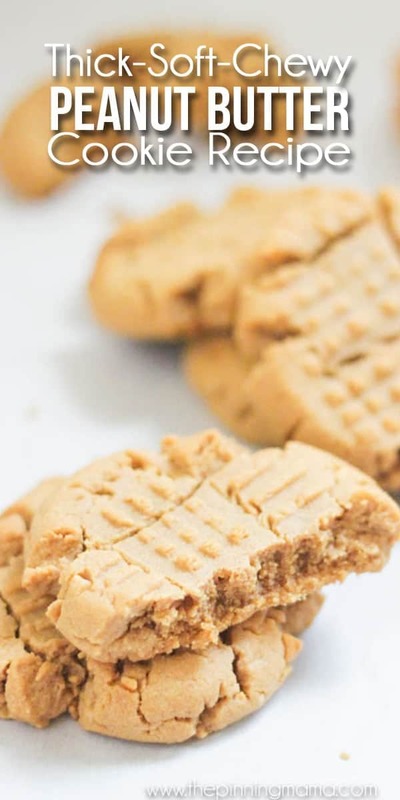 So yes, you can substitute the shortening for all butter, but no they won’t be the same cookie, although since it is a peanut butter cookie, chances are they will still be super yummy. Next, mix the sugars in with the peanut butter mixture until it is light and fluffy. Then stir in the eggs and vanilla until everything is combined. Then take the dry ingredients and mix it into the peanut butter mixture in thirds. I use my kitchen aid for this, but if you don’t have one then you can do it by hand, you will just need quite a bit of elbow grease, but you can do it. Hey, why not work up an appetite for those cookies? The dough will be stiff but not crumbly and should be easy to form into cookies. I make these by using a 1/4 cup measure to scoop the dough out then roll it into a ball and flatten very slightly using a fork to criss-cross the tops. This will make a nice big, thick cookie. You can make these smaller by measuring it out with a 1/4 cup measure then dividing the dough in half before rolling into balls. Bake at 350˚F for 10-12 minutes or until the center of the cookies are just set. This is one of the most important things to making the absolute best most delicious cookies ever. If you ver bake cookies they won’t be nearly as moist and devourable. Usually while they bake they will start to spread and the centers will be shiny, then right when they are perfect they start to lose that sheen and it is perfect to take them out of the oven. Each oven bakes differently, so it is something you will have to watch on the first batch then you should be good to just repeat there after. They will continue to cook after they are removed from the oven to absolute perfection for your consumption. After you take them out of the oven, let them sit for 2 minutes on the cookie sheet then move them over to the cooling rack to finish cooling. Grab a big glass of milk and dig in! I really hope you love these as much as me and my friends do! If you make them, I would love to hear about it. You can leave a comment below or tag me on Instagram @easyfamilyrecipes. It absolutely makes my day to hear that someone enjoyed my recipe! Start by combining your dry ingredients, the flour, salt, and baking soda, in a medium bowl and mix to combine. Next, combine the butter shortening and peanut butter in your mixer or a large mixing bowl. Make sure to use traditional peanut butter, not the natural variety. Mix the sugars in with the peanut butter mixture until it is light and fluffy. Then stir in the eggs and vanilla until everything is combined. Take the dry ingredients and mix it into the peanut butter mixture in thirds. I use my kitchen aid for this, but if you don't have one then you can do it by hand. The dough will be stiff but not crumbly and should be easy to form into cookies. Use a 1/4 cup measure to scoop the dough out then roll it into a ball and flatten very slightly using a fork to criss-cross the tops. Or, make these smaller by measuring it out with a 1/4 cup measure then dividing the dough in half before rolling into balls. Bake at 350˚F for 10-12 minutes or until the center of the cookies are just set. Remove from oven and let sit for 2 minutes then move them over to a wire cooling rack. My family loves these cookies!! I’m glad I made a double batch!! Thanks for sharing!! That is so great! It makes me so happy to know others are enjoying my recipes! Hi I thought you might like to know I made these and they were awesome. I made a few changes to make them vegan since my daughter is dairy and egg free. I substituted the butter for Earth Balance- same measurement. And I used two flax eggs- 2 Tbsp. Flax and 6 Tbsp. water, let sit for 5 minutes until gelled. I also added a cup of semi sweet mini chocolate chips. I made the cookies a heart shape for fun too. Yummy! Thanks for an awesome recipe. These are a keeper. I love hearing about your substitutions! I have people ask often but don’t always know what works best. So glad you enjoyed them and thanks again for sharing! Do you have to use shortening , or can you sub with coconut oil or Wesson oil ? The purpose of the shortening is to raise the melting point of the fats. It helps the cookies to bake more before they start spreading which helps them to be thicker. If you absolutely don’t want to use shortening, I would use all butter instead. I made these, substituting coconut oil for the shortening with no adverse effects. They turned out tasting great, soft, thick and chewy – perfection! The only down side with cookies this large is in getting less than 2 dozen cookies per batch. Is the brown sugar packed in the measuring cup or just soft and measuring cup filled? Hi Becky- I always pack my brown sugar when baking. Sorry that wasn’t clear! Yes I always pack brown sugar. Yes! You can freeze them either after you bake them or as dough balls ready to cook! Can you bake from frozen or wait to thaw? You can bake from frozen. They will be a bit thicker when you do this so you might want to flatten them prior to freezing. Love it. Easy to make and transport! Made these last night and they are great. Big, soft, and chewy. Freezing a few because my family is small. You are the Goddess of peanut butter cookies and if you have recipes for others I would love to be on the short list of receiving. This comment made my day! Thank you so much for the kind words and making me smile! Oh my goodness these are the best peanut butter cookies I’ve ever had and they turned out perfectly! This is the only peanut butter cookie recipe I’ll ever make again because I can’t imagine them any better. This recipe is genius! Hi Kimber. What would be the bake time if I cut the 1/4 cup size in half as per your suggestion? Thank you. These look yummy! Just made these cookies and they are AWESOME! Thank you for this wonderful recipe. On the website it did not say how many peanut butter cookie you made? How many peanut butter cookies it makes? Mine yielded the 3 dozen plus and I measured 1/8 of a cup of dough per cookie, which was half of what originally it called for with the large cookies. I decided to make smaller cookies so more could enjoy these magnificent works of art! I also used “natural peanut butter” as that is all I had. Might buy a jar of Jiff and see what the difference is? I absolutely adore them as they are! Thank you for sharing the recipe!! So glad you loved them as much as us! These cookies were exactly what I wanted them to be. The flavor, the softness,the yummyness. I did use one cup of shortening in place of butter. Will be sticking to this recipe. Thank you !!! Just made this recipe, and oh boy! These are the best peanut butter cookies I’ve ever had! 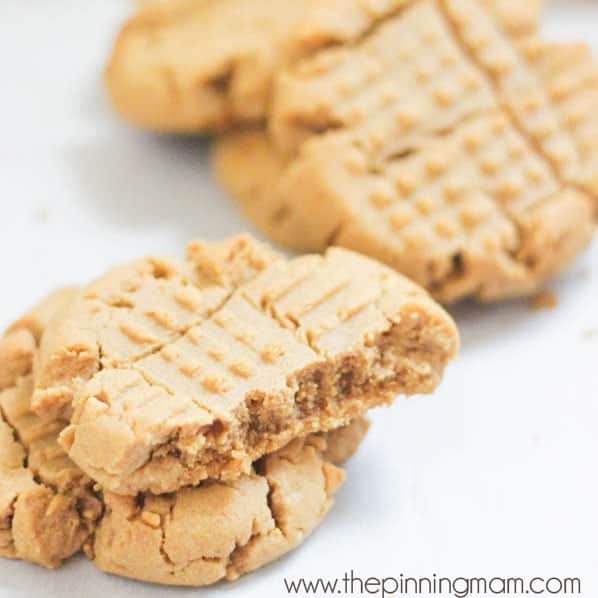 So many other recipes produce dry or hard peanut butter cookies, but these are so soft and just melt in your mouth! I like that it’s not like raw dough in the middle either but just the perfect texture. I didn’t make any modifications to the recipe, and it turned out perfect! Thank you!! This is the second cookie recipe I have tried to make from you blog and they both turn out super crumbly. The flavor is fantastic but I’m not sure why they’re turning out that way. I have to add milk to the dough or else the cookie falls apart when it’s out of the oven. Any tips? I would try using a little less flour. It sounds like the ratio may be a little too high. These cookies are so good, with the tenderness and yet crunch that I like. Will the cookies stay fresh? Tried these with a 2 cups flour & 1/2 cup Spelt flour, also added Dark Chocolate Kisses on top of some of them 😁 they’re the Most Delicious Peanut Butter Cookies I’ve ever made or had before!! Thank you Kimber for doing the research! You are so welcome! I am so glad that you love them as much as I do! These are so delicious, and quick and easy to make! I am stir crazy as we wait for what’s left of Hurricane Florence to pass through Charlotte and was craving something sweet. These certainly hit the spot. Thank you!! Stay safe! I am glad these could bring some smiles while you wait! How long the peanut butter cookies stay fresh? THey will be extra good for 1-2 days then start to get a bit drier after that. I always like to put what I have left the second day into the freezer because then they can be thawed or reheated in the microwave and taste just as fresh as when they came out of the oven. What about using butte and not shortening? My husband loves peanut butter but every time he asks me to bake him cookies it’s been oatmeal but last night I couldn’t sleep and I came across your recipe for these peanut butter cookies and I decided to bake them for a change. Well, by judging the huge smile on my husband’s face I now know what his favorite cookie is. They are like biting into a little piece of melting heaven. Thanks so much! That is fantastic! I love hearing that these made him smile! How many cookies does this recipe make?! Going to try these for Thanksgiving! About 18 large or 36 regular size. Enjoy! Turned out great! I substituted 1 banana in place of the eggs…mmm…peanut butter banana cookies! The best peanut butter cookies I have ever made. Will this recipe work with almond butter, cashew butter, soy butter or sunflower seed butter? Does this recipe work with soy butter or sunflower seed butter?